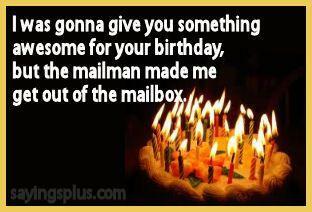 I was gonna give you something awesome for your birthday, but the mailman made me get out of the mailbox. Dani: Well, couldn't send the cake, because I ate it, after removing 'tons' of candles. Had to do that due to the fire alarm going off. Dani: Could send the cake, because I ate it, after removing the 'tons' of candles. Had to do that quick because the fire alarm went off.